Do you love yoga and would like to make a living by following your passion? Would you like to deepen your practice and learn to live a wholesome yogic lifestyle? Are you keen to immerse yourself in an inspiring spiritual environment that is applying yogic wisdom in all areas of life, from nutrition to meditation, from physical movement to spiritual practice? Then join us at the Krishna Village for our 6 week full immersion Yoga Teacher Training. In our modern society, yoga has been deconstructed to be only a shadow of its complete whole. It is far from the complexity and power of the original yogic wisdom, which spans all areas of life and provides a holistic system of health, wellbeing and spiritual connection. At the Krishna Village, we are aiming to revive and teach yoga in its wholeness, so you can BE a yogi, rather than just DO some yoga. Our Yoga Teacher Training is therefore a full immersion program that spans 6 weeks and will allow you to experience yogic living in its entirety. From daily morning yoga to seva in our organic gardens, from philosophy classes to healthy food preparation, from Kirtan singing to mantra meditation you will live and breathe yoga, while being immersed in a kind, loving and supportive community. You will not only learn all required practices to become a fully accredited yoga teacher with Yoga Alliance, but will also gain teaching practice with real students through our retreat centre - first co-teaching with fellow trainees and then bit by bit growing into teaching your own classes. Keen to come along but you don't want to become a yoga teacher? Then have a look at our YTT Immersion Retreat option. Full immersion program that spans 6 weeks, living in a fascinating, vibrant community of about 75 yogis, travellers and spiritual seekers on an eco farm between Byron Bay and the Gold Coast in Northern NSW, Australia. Nourish your soul with Yoga Teacher Training (Vinyasa style) that addresses the science of yoga holistically including postures and philosophy as well as Ayurveda, Kirtan, anatomy and physiology, nutrition, meditation and mindfulness. To see if this experience is for you, read our FAQ for Yoga Teacher Trainees and have a look at our Code of Conduct. If you are dealing with any physical or mental health issues, please also check our Are you ready page to make sure this is a suitable course for you. Does it feel like something is missing from your life? That you are lacking purpose? Is there a void that you just cannot seem to fill, or are you looking for a practice to keep you healthy and mindful? Becoming a yoga instructor could be exactly what you have been looking for. Krishna Village is a yoga retreat center that offers both retreat accommodation and yoga instructor training, and we invite you to consider becoming a certified teacher by taking one of yoga instructor training courses. Here you will find everything you need and have a great time while expanding your skills. We offer comfortable accommodation, delicious vegetarian food, and some of the best yoga trainers to be found in Australia. Time to give yourself the new beginning or big change you have been yearning for in your life. Krishna Village is the perfect place to get your yoga training. We have several courses available and offer lots of wellness programs to add to your experience. 200hr course – The 200-hour yoga training course is perfect for yogis who have had a solid practice for at least one year and feel ready to take things further. You will be trained by the best yoga teachers, and this transformative 6-week course will truly change your life. Dive into the practice and knowledge of yoga, and immerse yourself in a variety of activities and classes. 300hr course – Our 300-hour Yoga training course is the 2nd level of our training program. Yoga teachers can perfect their skills by taking this additional immersion course and receiving valuable feedback from skilled senior teachers. Not quite ready to take on a full course just yet? That is ok as well because at Krishna Village we have lots of solutions available to you. Complete beginners can book into our retreat, experience the breathtaking beauty of the Byron Bay hinterland and enjoy daily yoga sessions while learning all sorts of things about this way of living. While you stay in our retreat, you will get to experience firsthand holistic living, yoga philosophy and kirtan, while eating vegetarian foods and enjoying daily yoga sessions. Become a part-time yoga instructor and earn an additional income while deciding whether you want to pursue yoga as a full-time career. Learn to balance life and all other activities harmoniously. Want to take a yoga instructor course? Then it is time for you to make your booking at Krishna Village. Our retreat holidays are perfect for complete beginners, and our 200-hour and 300-hour courses are brilliant for mastering yoga skills so you can enjoy all the best benefits of this ancient practice. The Krishna Village can host up to 75 people in a combination of rooms, dorms and camping spots. There are usually around 30 full time volunteers who work in our organic gardens and maintain the grounds, 15-25 retreat guests or Karma Yogis and up to 20 yoga teacher trainees. The Krishna Village has 3 double rooms (1 big bed), 5 twin share rooms (bunk bed) and 8 single rooms. They are all set in former shipping containers that have been renovated and turned into simple but comfortable accommodation. All Twin Share rooms are equipped with bunk beds. Bedding is being provided but you bring your own towels and toiletries. We offer a female and a male dorm - each for up to 4 people - and one 3-share dorm. The dorms have bunk beds and wardrobe space for your belongings, and bedding is provided.They are simple, older rooms and about 100m from the amenities block. Meet Yoga Teacher and Film Maker Giulia Lops from Brasil and find out what she loved about her time at the Krishna Village, what she learned about her Dharma and where her yoga journey has led her since completing her 200hr Yoga Teacher Training at Krishna Village in 2017. Meet Yoga Teacher Winter Harvey from Hawai'i and find out how she scored her dream job at a popular Honolulu yoga studio straight after her Level 1 Yoga Teacher Training at Krishna Village, and why she flew half way around the globe again to complete her Level 2 training here, too. Graduate Eleonor shares her epic story: The Swedish traveller came to Krishna Village and decided to do her Yoga Teacher Training here with us and only months later, back in Sweden, got offered to take over and run a yoga studio - the Mandala Soul Studio. How is that for manifestation skills?! 3) If you prefer to pay in several rates, please select "Paying in instalments" in the additional options and pay a deposit + 4 instalments (monthly or fortnightly, as detailed in the end of our 2018 price list, depending on your course start date). If you have questions before booking, you can call us on +61 (0)2 6672 7876 or email us through our contact form. Payment plans are available - for details, please have a look at our price lists linked above. To book with a payment plan, please select the according option during the booking process. Required course materials: Check our shopping list for a list of the items you need. Lila, Michael and the other teachers are all Bhakti Yogis and have all been living a healthy, wholesome, yogic lifestyle for many years. Amongst them, they have run several yoga retreat centres and yoga schools and taught hundreds of classes in the yoga, philosophy and personal development realm. Lila Kirtana completed an Education degree at the University of Technology Sydney in 1998, and has been teaching yoga since 2005. After spending 2.5 years deeply immersed in the yogic lifestyle as a volunteer in a yoga ashram, from 2008 onwards she has been working full time as a yoga teacher trainer in Byron Bay [Certificate IV in Yoga Teaching, RYT-500, Cert IV in Training and Assessment]. She completed Pre/Postnatal Yoga training with Bliss Baby Yoga in 2012, and now also is a regular presenter on their courses. After becoming a mother, Lila completed a Kid's Yoga teacher training with Zenergy Yoga in 2014 and occasionally teaches Mum's and Bubs, Mum's and Toddlers and Kid's yoga classes in the Byron Shire. Lila also holds a Diploma of Remedial Massage, is the lead singer of the enCHANTed band which holds regular kirtan evenings in the Byron Shire and at Yoga Festivals, and has a deep knowledge and understanding of Ayurveda through years of study and regular trips to India. Lila is a passionate Bhakti yogi inspired to share the things she loves through yoga teacher trainings. Michael 'Laxmivan' began his yoga journeyat the age of 20 when he left his profession as a studio musician and joined a bhakti Yoga Monastery. For the next 10 years he travelled Australia, New Zealand and India as a celibate monk, daily studying the traditional yogic canons and engaging in strict daily yogic sadhana. Then after another 6 years as a traditional Vedic (Hindu) priest, he took an interest in the more physical aspects of yoga. He successfully completed a 3-year diploma course with Satyananda Yoga before finally finding his passion with Power Vinyasa. 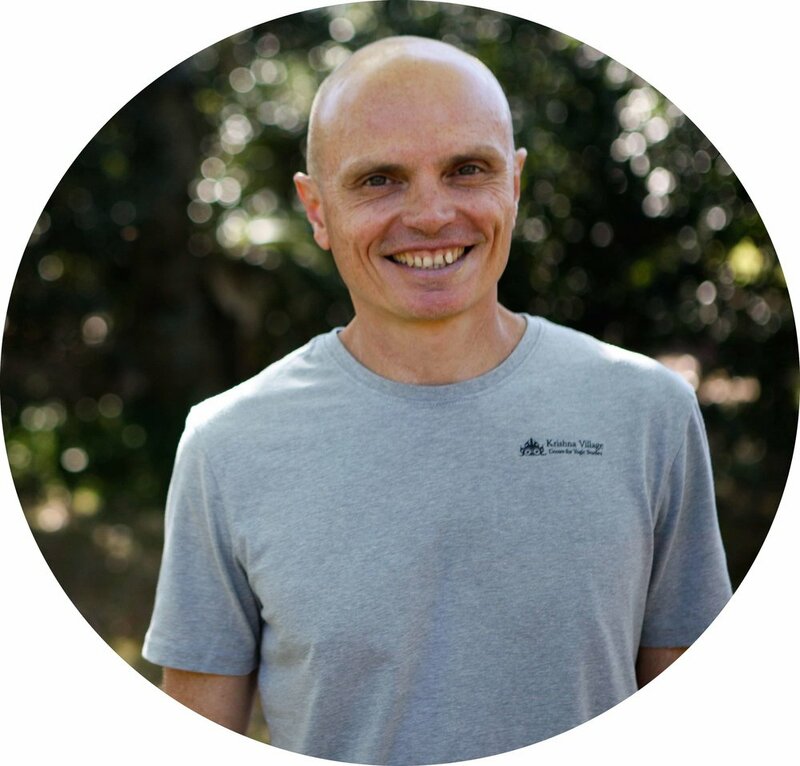 Since then he’s been certified by Baron Baptiste, became certified with Anti Gravity level 2, founded one of Australia’s most successful regional yoga studios, and has helped pioneer, develop and facilitate many teacher training programs here in Australia. As a teacher trainer, Michael brings with him great integrity and depth, forged by more than 31 years of strict, yet joyful daily practice. His teaching is full of compassion, humour and authenticity, with a deep respect for tradition, but without being over zealous. Michael our philosophy teacher (Bhagavad Gita & Patanjali's yoga sutras), is a student by morn, a teacher by noon and a rapper by night. At 17, while studying Maths, Physics and Business, he was noticed by Young Entrepreneur after joint-founding a company that personalised gifts in Greater London, which went on to win a Future100 award for ethical and environmentally-friendly business. He came across Bhakti-yoga in university and after graduating in Business from Cass Business School and landing a job in UBS international bank, he decided to explore the wisdom of yoga further. Having been to India 7 times over the past 5 years to study and explore the secrets of the Indian wisdom texts like Bhagavad-Gita, he was invited to teach philosophy and host interactive life seminars in universities and institutions in the UK, Belgium, Netherlands, Nigeria, India, Australia and New Zealand since 2010. Outside of teaching Michael enjoys travelling, cycling, playing football, volleyball, basketball, rapping, writing, advising, problem-solving and challenges anyone on earth at table tennis. Maria Kirsten, MA, eRYT500, found yoga in 1988, and has been teaching beginner's yoga in Lennox Head since 2000. Originally from New York, Maria started her working life at a secondary school English teacher. Certified originally by Yogalates, Maria has continued to study anatomy, yoga therapy and is finishing her qualification to be an Occupational Therapist. Her classes are based on functional movement, and are very visual and fun. As a lecturer for yoga anatomy, Maria's mission is to prepare new teachers to teach safe classes that support the individuality and radiance of each of their students. Her work is all about how to make the powerful poses and practices of yoga safe, simple and accessible to all. Emma fell in love with yoga over 16 years ago and has maintained a disciplined practice ever since. She is passionate about the eight limbs of yoga as a vehicle for awakening to the truth of who we are - to find connection to the divine, creative energy within. Emma is a 200-hr trained Akhanda yoga teacher under the mentorship of Nick Sadashiv Bradley and Radha Rani Bradley of Akhanda Yoga Australia - discovering this holistic and authentic yoga practice 2 years ago after 12 years of dedication to Iyengar Yoga. Emma has travelled to India a number of times including 2 months with Pankaj Sharma in Rishikesh, in 2003 and spent many years under the guidance of teacher Susan Stackhouse in her Iyengar studio on Sydney's Northern Beaches as a student and teacher. In addition, Emma has been a primary school teacher for 15 years and is also currently undertaking study to become a Certified Life Coach. Nestled in the foothills of Mount Warning, in the heart of the Northern Rivers of New South Wales, the Hare Krishna farm “New Govardhana” is a 1000 acre property with orchards, certified organic veggie gardens, cows, horses, streams and swimming holes in abundance. Payment plans are available - for details, please have a look at our current 2018 price list. To book with a payment plan, please select the according option during the booking process.